I'm desperately trying to get back into the manipping game, I see all sorts of pictures with potential that I'd like to try! However, when I go to do the work, I end up screwing up in some way, and then I get frustrated. So I put this post here seeing if I can get some help in making manips! Any help at all is appreciated, and if this post has already been made before me, I'll delete this. Or ask a moderator to delete it. I'm not sure what I can and cannot do here. Well, I may have some advice to give once I get back into the manipping game as well. (Which will be fairly soon.) For now I'll just say that when making text manips of anime style images it is usually a good idea to use the font commonly seen in mangas. ...What's that called, by the way? I'm not sure what it's called. Sorry to say. There's not a single font that's used for manga scanlations, but 2 common ones I know of are Wild Words and Anime Ace. Wild Words is what I use for all my text manips. Thanks MW, you know it's odd. I can't seem to find Wild Words. Do you think you would be able to post a mediafire link? Well, the thing is, it's actually a commercial font, which I didn't know until after I downloaded it. I can give you a link to the site I downloaded it from: http://www.ufonts.com/search/wild%20words. Just download the .TTF file; don't use their installer. If you can't get it from there, for whatever reason, PM me. What I want to learn how to do is make a spiral/eyes glow. Its an effect I love, but I always screw it up. Ah, well I couldn't help you with that. I always just use PhotoShop for that. It provides a beautiful clean glow in a variety of styles. Personally, I'd recommend that over any other method but others may differ. If anyone here finds it helpful I recently made a glowing eye tutorial for SAI and photoshop, it should be straight forward. Huh... Why didn't I think of th- Wait a minute! Hypno-tan! That sketch in the bottom corner is good (and funny)! Why haven't we seen any original art from you before? Well, thanks for the tutorial, in any case (but seriously, I'd like to see more like that sketch). That's the cutest tutorial I've ever seen! This whole thread is making me want to manip things...uah. 2. resize it to how you want it to be on the iris, and skew it so it looks like it's in the same plane as the iris in question. In PS you control-click the edges (not the corners) while transforming to get this kind of skew. Maker sure you cover the whole iris. 3. set the transparency to about 50% so you can see the iris. Add a layer mask and paint out everything outside the iris so the spiral layer is only visible over the iris. Bring the transparency back up to 100%, repeat this step as necessary until it looks right. GIMP and Photoshop are practically the same. So, I'd say you probably can. I plan on trying on an old manip at some point. I don't often do spiral manips just because I find them a tad corny buuUUUut what I would do is make a square selection, roughly around the size of the eye, fill the square and make one half one color and the other half another, Filter>distort>twirl>set to 999 and do that twice to get a twirl with the colors and size I want. Then I cut out the characters eyes and place the spirals underneath and adjust the size accordingly, if I want the pupils to still be seen I just ctrl+X>ctrl+V them and lower the opacity. NOW this is one thing I think ALL manippers should account for when doing spirals because I've been seeing it a lot lately and personally I don't think it looks very good, its a matter of opinion but it is still worth noting: When you apply a spiral, make sure the eye doesn't loose its depth, put a white circle, dot, shape, any sort of shine on the eye and a bit of shading if need be. So if the original pic had a shadow going across the side with a shine dot, put a shadow going across the side with a shine dot over the spiral so it doesnt look forced in. Just gave it a test drive, works like a dream! Command me my hypnotic beauties!! Mwahahahaha! no prob, I have been using things like SAI and photoshop a lot for the last 4 years so I can get around them pretty well. Anyway spirals are almost universally larger than the target size, so you don't risk losing detail because you can just scale down. If it gets too noisy because the features are getting to small, you just stop scaling down and mask at whatever size you happen to reach. If that still doesn't work, it's not a good pattern for an eye to begin with. That said, thanks for expanding step 1, sometimes you do just wanna make your own spiral. Great tutorial image. That was a very well done tutorial. I was actually planning to make something like that myself eventually, to a similar effect. Although, I also find spiral eyes to be cheesy (as well as lazy and unauthentic) I still had a tutorial for them my list of things to do. So having you make one for them is actually a huge relief for me. Thanks Zko, you're really awesome. A little more beginner-y tip, but if you're using GIMP (dunno if other programs have an equivalent) and you're open to the idea of a little cleaning or redrawing, the path tool is your friend. Here's a really basic technique for adding outlines to text, but maybe this will be helpful to someone. Unfortunately, I'm not talented enough to make one of those pretty picture tutorials. Note: I only use GIMP, so that's what this tutorial will address. Place your text as normal. Right click the "Layers" tab. Select "New Layer", and choose "Transparency" under "Layer Fill Type". Move the new layer to just below the text layer. Right click the text layer and choose "Alpha to Selection" near the bottom. Click "Select" in the menu bar, and choose "Grow". Increase the selection by your desired number of pixels (my example uses 3). Make your transparent layer the active layer again, and fill in the selected space with your chosen color. 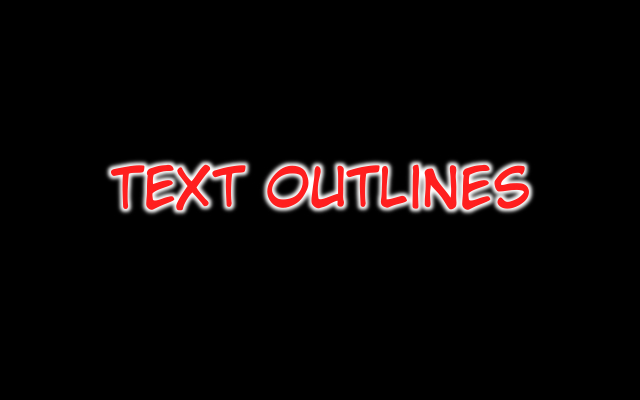 If you want to make your text outline look more "glowy", with your transparent layer selected, go to "Filters", "Blur", and "Gaussian Blur". By using the preset of 5, you make your outline look like this. I could explain how to make speech bubbles too, but that one will probably require visual aids. I might as well tell people how to do that on photoshop since it can come in handy, although I'm beginning to wonder if I'm the only manipper here who uses Photoshop .-. 2. FOR AN OUTLINE select Stroke and configure the setting however you please. done, you can also add drop shadows, inner glows, gradient overlays, etc with the other blending options if you so choose. It's just that... you know... GIMP is free and Photoshop isn't. Come to think of it... You can probably use the stroke tool in GIMP and skip several steps... I need to check this. Edit: It doesn't really work like I thought it would. That's true, unfortunate since it makes a lot of things really easy. I remember back on Hypno-chan in the Creativ Development board there was a thread where HiG posted a drool tutorial. I lost it and the site went down so... I was just wondering if anyone else might be able to make another one. I liked the one that HiG made but I feel like it would only be applicable to images of a certain art style. I believe the explanation that Zko gave about making drool back on the booru was very multifaceted. I tried it once for myself but I think I messed up the image. If anyone could make a tutorial or two for adding drool I would be most appreciative. Found this, does it help? Edit: once I tried manipping some drool on a photo, it's kinda hard until you realise it's just making bright lines and dark lines on top of the image. I think it might be similar with drawings.